Photomerge Scene Cleaner in Photoshop Elements sounds like a tool you might see in an episode of CSI to mop up a crime scene, but it isn’t quite that gory. This member of the Photomerge commands family enables you to create the optimum image by allowing you to eliminate annoying distractions, such as cars, passersby, and so on. To get the best source images for a clean scene, take multiple shots of your scene from the same angle and distance. It also works best when the elements you want to eliminate are moving. 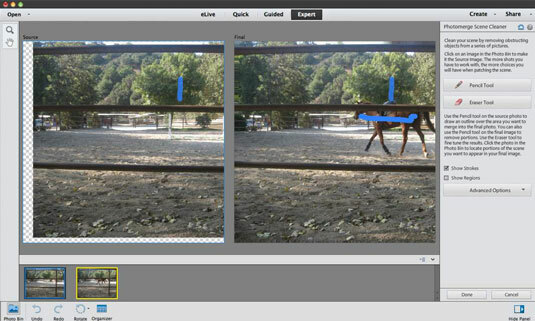 Choose Enhance→Photomerge→Photomerge Scene Cleaner in any of the edit modes. Elements attempts to auto-align your images the best it can. Take your best overall shot of the scene and drag it from the Photo Bin onto the Final window. With the Pencil tool, draw a line around the elements in the final photo that you want to be replaced by content from the source photo. Repeat Steps 4 and 5 with the remaining shots of the scene. With the Alignment tool, click your source image and position the three target markers on three key locations. Do the same on the final image, choosing similar locations. Click the Align Photos button in the Advanced Options section. Again, as with the other Photomerge commands, the more similar your starting source images are (framing, angle), the better the merged result. If you make a mess of things, click the Reset button and start over. The resulting image opens as a new file in Elements.